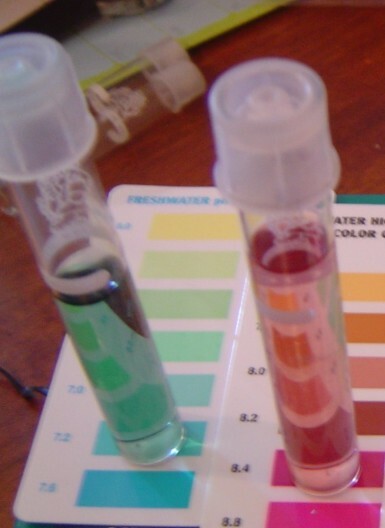 Aquarium pH is a measurement of your aquarium tank water in terms of it being acidic, alkaline or even neutral. The scale that is used is from 0 to 14, where 0 to 7 is acidic and 8 to 14 is considered alkaline. Different types of fish will thrive in certain conditions but they also usually have a tolerance to a wider range from the optimal. For instance, my clown loaches can thrive in water from alkaline to slightly acidic. Many fish, if not most, will become accustom to the prevailing pH conditions as long as it’s not too far outside their optimal range AND if the change is introduced slowly as in the case of their natural environment where the range is shifting all the time. Even in your own artificial aquarium environment the water conditions will change when you either add or subtract any elements from the water. By this I mean, if you add any rocks, plants or decorative items for example, the water conditions will also start to vary and change whether it’s towards the alkaline, acidic or neutral range. It just depends what you put in the water. I used a chemical reagent called “Bromothymol blue”, adding about 5 drops from the bottle to water from my tank in a little test tube that is provided in the kit. Usually, they also supply a little plastic card that has the pH range color on it. You just match up the color in the test tube with that on the card to check the condition of your water. If it is not right then you can add either one of two chemicals to adjust the pH either up or down depending on your situation. These chemicals may come in the same kit as the testing liquid or you might have to buy it separately. Every reputable pet store or aquarium supply shop should carry these products. But again be WARNED. You must change water conditions for your fish’s environment slowly. It’s the rapid changes that stress fish out and it could easily lead to the death of your fish if done too quickly. I hope this little discussion on Aquarium pH has been of help.